Last night marked the star-studded premiere of the much-anticipated new crime drama, A Most Violent Year at the Florence Gould Hall Theater. Director J.C. Chandor, and stars Oscar Isaac and Jessica Chastain all made their way down the red carpet, accompanied by former Girls co-stars, Zosia Mamet and Christopher Abbott. The night continued with an after party presented by Giorgio Armani, who dressed the big names for both the event and the film, at Armani / Ristorante, where guests including Zachary Quinto and Dan Stevens helped continue the celebration. Click through for an inside look at the A-list premiere and get a sneak peek at the vintage style Chastain's character flaunts in the new film. 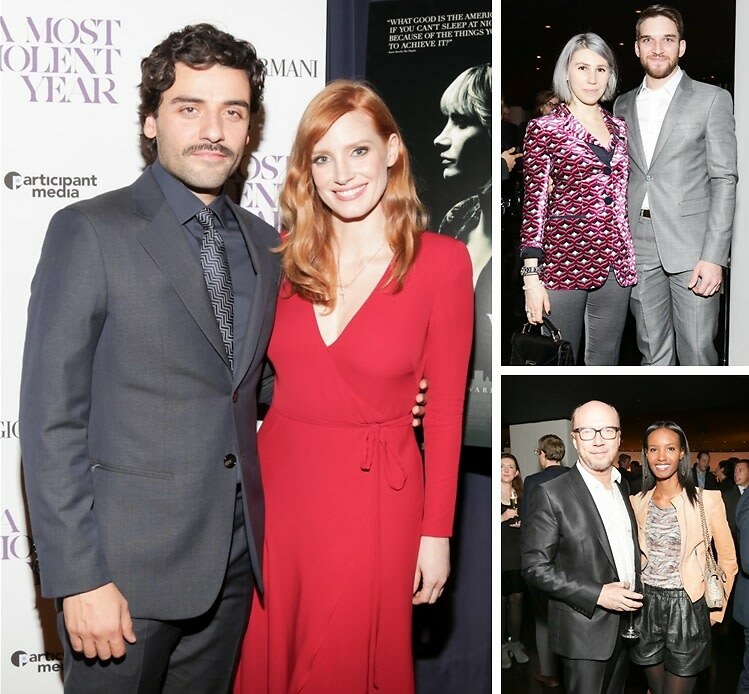 Who was there: Guests included Oscar Isaac, Jessica Chastain, Christopher Abbott, Peter Gerety, Glenn Fleshler, Jerry Adler, Ashley Williams, Ben Rosenfield, Gisele Eisenberg, Taylor Richardson, J.C. Chandor, Neal Dodson, Anna Gerb, Jim Berk, Jonathan King, Zachary Quinto, Miles McMillan, Zosia Mamet, Evan Jonigkeit, Ang Lee, Michael Moore, Kim Gordon, Lindsay Ellingson, Sophie Auster, Dan Stevens, Megan Boone, Cherry Jones, Paul Haggis, Tom McCarthy, Michael Weber, Marc Webb, David Chase, Geoffrey Fletcher, Paul Schrader, Oren Moverman, Maggie Betts, Elizabeth Vargas, and Lawrence O’Donnell.